In 1926, Dadswell was employed by the Council for Scientific and Industrial Research, in its Forest Products Division where he was put in charge of collecting wood which was a necessary basis for research work. He liaised with various International and national Forest agencies to build the collection. The bulk of this collection was collected from about 1929 to the mid 1930’s. It consisted of wood from all states, in particular 39% from New South Wales, 36 % from Queensland, 10% from Victoria and the remaining 15% from South Australia, Tasmania, Western Australia and from the ACT and Northern Territory. To cater for variation within species, more than one tree was needed as a resource, and between 6 and 10 different trees were sourced for many species. Blocks were taken from the base of the tree, from its top and from a limb. All told there were about 2400 blocks collected, representing 380 species, weighing an estimated 10 tons. Dadswell was the driving force behind this collecting. 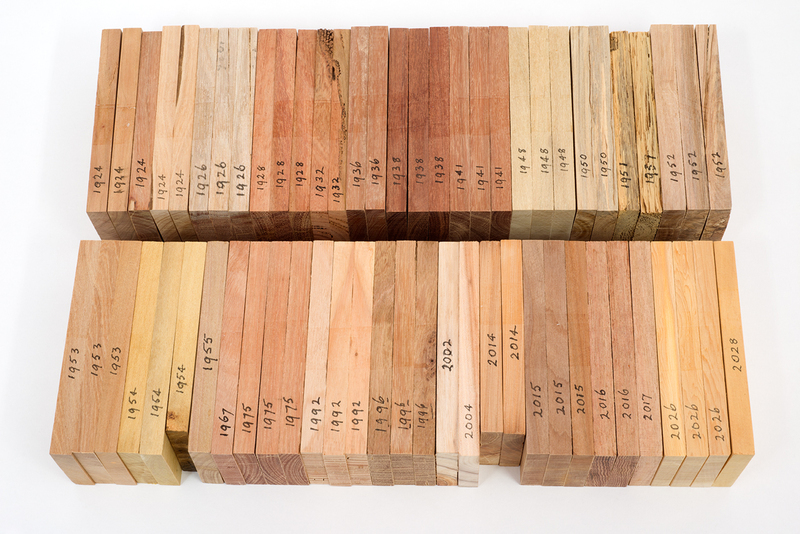 These samples come from a container of wood that made its way from Port Melbourne (1975), via La Trobe University and the Australian National University to The Victorian School of Forestry in 2004. In 2011, The Wood Collectors Society contracted to process specimens for the University of Melbourne. H. E. Dadswell, “'Off Cuts' from the H. E. Dadswell wood collection. ,” Creswick Campus Historical Collection, accessed April 20, 2019, https://omeka.cloud.unimelb.edu.au/cchc/items/show/1009.